RESTORING OLIVIA: Surviving Yet Another Detour to our Promised Land - Keppra drug reaction and weaning. Surviving Yet Another Detour to our Promised Land - Keppra drug reaction and weaning. Are you as upset as I am? Dang it, she was doing so well and then we get thrown off track again. Another detour on our trek to the Promised Land of healing. Do I sense a snicker? Ha! Yes, despite the long road and the constant "wandering" off course, I still believe she can fully recover. I know ---- for some its painful to witness such faith. I have plenty of people in my life whose body language screams uncomfortableness as I "cling" to something that is an impossibility in their mind. But that's the point. God gives us all faith to believe in the work he's doing in our own lives -- He doesn't necessarily give it to those outside of it. Not to get too offtrack, but what do you think the scene was for Abraham as he met his friends at the watering hole 16 years after his original announcement that he would be a father in his elder years? Did they snicker and whisper to each other as he walked away? I'm sure they thought he had developed some sort of dementia! I know my story isn't like Abraham's, the grandeur of his promise is too great for words - and my journey. I am just a momma......Standing in front of my God.......Looking for direction on how to heal my girl. I am willing to walk this out with you and share my journey, even if it doesn't make sense. Believe me --- I know it may look impossible. That's why God is in the drivers seat, and this time I cannot skooch him over when the need to control the situation overwhelms me. Trying to control, and actually thinking that I could reminds me of Natalie Grant's incredible song King of the World. This kind of faith is almost childlike - right? Jesus said we need it (Matthew 18:2) and David had it when he defeated Goliath (1Samual 17:37). I was reminded of this "childlike faith" truth while listening to the "Grow Up" sermon series from Hosanna! church. God certainly wants to "grow us up". He wants strong, spiritually mature believers that retain faith that is similar to a child's trust. Real moral fibre is developed through discipline of faith. You have made your request of God, but the answer does not come. What are you to do? Keep on believing God's Word; never be moved away from it by what you see or feel, and thus as you stand steady, enlarged power and experience is being developed. The fact of looking at the apparent contradiction as to God's Word and being unmoved from your position of faith make you stronger on every other line. Often God delays purposely, and the delay is just as much an answer to your prayer as is the fulfillment when it comes. "The word of the Lord tried him." It was not the prison life with its hard beds or poor food that tried him, but it was the word God had spoken into his heart in the early years concerning elevation and honor which were greater than his brethren were to receive; it was this which was ever before him, when every step in his career made it seem more and more impossible of fulfillment, until he was there imprisoned, and all in innocence, while others who were perhaps justly incarcerated, were released, and he was left to languish alone. These were hours that tried his soul, but hours of spiritual growth and development, that, "when his word came" (the word of release), found him fitted for the delicate task of dealing with his wayward brethren, with a love and patience only surpassed by God Himself. No amount of persecution tries like such experiences as these. When God has spoken of His purpose to do, and yet the days go on and He does not do it, that is truly hard; but it is a discipline of faith that will bring us into a knowledge of God which would otherwise be impossible. 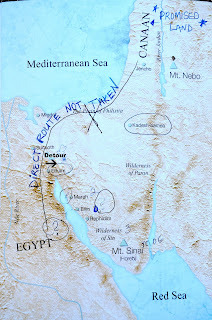 I've done several bible studies on the Israelites Wilderness/Promise Land journey and with each one I gain a deeper understanding of just how similar my modern day trek (16 years) is to the 40 year one detailed in the bible. Like them, I have been frustrated, grumbled, complained, struggled with humility, misunderstood His leading and regrettably let fear control my decision making. I no longer get bogged down in the "whys" of God's choice for Olivia's life, just as the Israelites had to accept that God chose the wilderness for his "chosen". They could see it as they camped that first night in Etham. I, on the other hand, was blindsided as my perfect baby girl developed "complex" symptoms no doctor could explain, and then detour after detour as attempts were made to straighten her path. The detours. Ugh! Some days I wonder how we can be so unlucky, when each treatment begins with promise only to end with a downward spiral as my mind would scream, "Why do you hate me so much?" Abiding in Him is the key to my promise land. If I am abiding in Him, then the darkness of fear, doubt, hopelessness and worldly (i.e. logical) thinking of impossibility cannot detour me. Again, sounds easy to do when opposition isn't running rampant, blowing the pieces of her complex puzzle here and there. How do I continue to believe that God is leading me despite not having a visible "pillar of cloud by day and a pillar of fire by night (Exodus 13:21-22), as the Israelites did? By developing a personal relationship with Jesus, which ends up being a journey itself. Believing, faith, trust - so easy to type the words out, but to actually wholeheartedly adept the qualities of these words can be a long journey. At least for me it was. Currently, I am weaning Olivia off the Keppra and it has gone smoother than I imagined, but she is still having some tough dips as each change is made. I struggle with the constant need to badger myself for allowing her to be put back on this dang drug - especially with the months of weaning in our future. Wasn't it Albert Einstein who said "The definition of insanity is doing the same thing over and over and expecting different results". So. True. No wonder I feel on edge when talking with Neurologists about the next drug to try. Insanity. Smiles. Engaging....similar to a new born baby recognizing you for the first time. Fresh beginnings. Hope renewed. I could go on and on about her good days. The more I study the Israelites path, the more I can relate, and it extends past their year long camping trip at the base of Mount Sinai where God pulled them close to solidify His covenant with them. 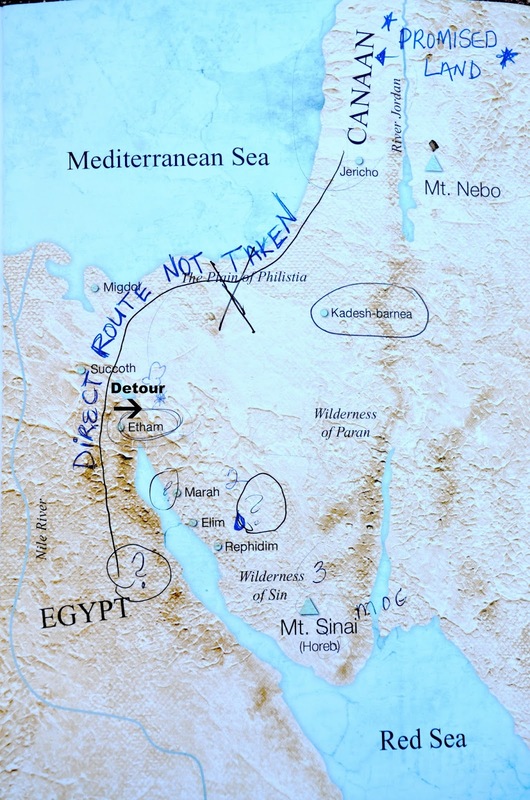 We all know they wandered for 40 years, but as I dove into the details a bit further, I learned that 38 of those years were spent circling a city just to the south of Canaan called Kadesh-barnea - right on the edge of their Promised Land. They sent in 12 spies, they came back with a detailed description of how fruitful the land was, but all but 2 gave a bad report of the strong and powerful tribes that lived there. They were afraid and they chose to stay put. Priscilla Shirer's "One In A Million" study and other commentators talk about these "spies" in a little more detail. Each tribe chose one leader --- 12 tribes = 12 spies. What's interesting is that these chosen "influencers" were the smart ones, everyone looked up to them and valued their opinion - they were the decision makers. And they were wrong. They were afraid and did not believe that God would do what He said He would do and they influenced nearly 2 million people to not believe for God's promise. Only 2 of the original two million Israelites made the trip to the Promised Land - Joshua & Caleb - the 2 spies that believed God, the rest died in the Wilderness, never receiving the bounty God had planned for them. It made me think about the "influencers" in my own life, and in our situation. For 16 years I have taken Olivia to doctor after doctor, specialist after specialist, expert after expert and they all have been wrong. I've been circling around the same old information, trying the same set of drugs and/or supplements and have been stuck just outside her Promised Land of healing. I remember when I first heard of Charlotte Figi - the little girl with uncontrolled seizures in Colorado whose seizures miraculously stopped with Medicinal Cannabis, I was filled with a renewed hope. I talked with her Neurologist about possibly moving out there to give it a try, but she didn't believe it would help her ---- and she influenced me and I chose to stay put. And that was that. I believed the doctors negative report over the passion and belief God was working in me that she could in fact recover. My influencers tore down my hope and I wallowed for years in my own little Kadesh-barnea, just outside God's abundant fullness of health. I have new "influencers" now......new experts to listen to and as we work through weaning issues and optimal dosages for the miraculous "new drug" called Medicinal Cannabis, I can officially kiss my Kadesh-barnea goodbye (and good riddance) and finally begin my walk toward the Jordan. Natalie Grant sings about how we put God in a box that we've designed, but in reality we all have people and "experts" in our lives that contribute to the box and actually help press down the packing tape. I just want to stop feeling foolish. Feeling foolish over decisions that at the end of the day were made "under the influence". I'm sure we have all experienced these regrets, but as I look into the eyes of my blue eyed beauty I can't help but cry myself to sleep because of the pain she has been in for her entire childhood. I want her to be the One in A Million - and so does God! Next on my list of study is........I definitely have the faith, but is it God's will to heal her? This is actually a question that a couple pastors I have talked with have asked --- hmmmm. That blog post coming up next. Keep the faith, I am praying for you and your daughter. I have epilepsy and the meds (keppra) are killing me. Fear has kept me from trying alternatives.